How Does It Feel to Be Shocked by Electricity? At 16, Curt Brinkman knew climbing a power pole was dangerous. He just didn't realize how dangerous. On a sunny day in Shelley, Idaho, in 1970, Curt was working on a farm and climbed a power pole for fun. He got perilously close to a 36,000-volt power line. The electric shock stopped his heart, and his lifeless body plummeted to the ground. Fortunately, the impact of the fall started his heart beating once again. Curt was so badly burned that doctors were forced to amputate both legs above the knee. Before the accident, he had been a 6'7" tall athlete with dreams of playing professional basketball. After five months in the hospital and two months of rehabilitation, Curt turned his ambitions elsewhere. Curt organized and began competing in wheelchair marathons, setting many world records and winning eight Paralympic medals and countless other medals. 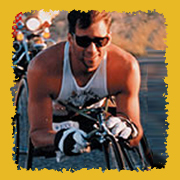 In 1980, he won the Wheelchair Division of the Boston Marathon in 1 hour and 55 minutes—the first wheelchair athlete to break the 2-hour barrier. Prior to his death in 2010, Curt was an educator, a motivational speaker, and author of the best-selling books, The Will to Win and Still Winning/Lessons for Life.